David Yurman earrings from the Petite Cherise Collection. Pavé white diamond channel setting. Naturally colored, freshwater pearl center. 0.3 total diamond carat weight. David Yurman stud earrings from the Châtelaine® Collection. Sterling silver. Pavé white diamonds trim bezel and prong setting. Your choice of hampton blue topaz or purple/gray amethyst over hematite, 9mm (0.4"). 0.29 total diamond carat weight. Post backs. Imported. 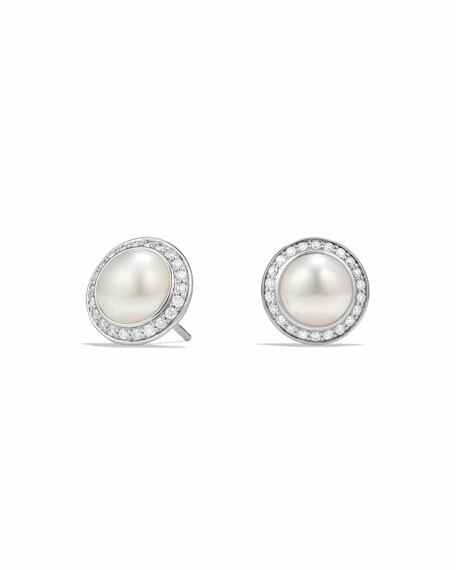 David Yurman earrings from the Albion® Collection. Polished sterling silver bezel setting and posts. Faceted prasiolite cushion studs. Omega backs for pierced ears. Approx. 0.4"H (11mm).